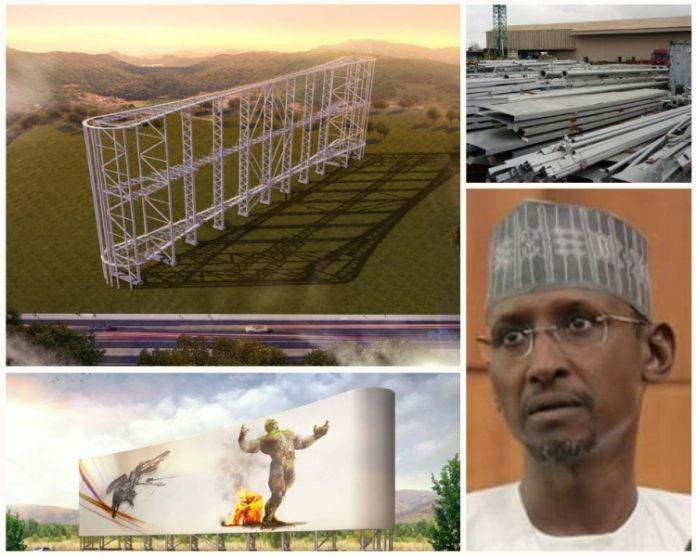 Just when Nigerians were about to recover from news on the hideous broom erection saga at the city gate in the country’s capital city, another unfolding story has emerged regarding the Federal Capital Territory (FCT) Minister, Justice Mohammed Bello’s sudden backtracking on the proposed million Naira billboard project by the LONA Media Limited irrespective of plans made afoot for project execution. SecretReporters gathered that the proposed world record-breaking project, was planned to serve as a tourist attraction and as well an advertising platform for businesses in Nigeria as the idea was believed to have emanated following the jaw breaking increase in revenue accrued to both the company and in tax generated to the Federal Government after the company’s 2016 inauguration of the Africa biggest billboard located at Airport Road, Lugbe interchange Abuja. Encouraged by the company’s success, the Abuja- based indigenous outdoor advertising agency on 24th of April, 2017 applied for a site allocation for their capital intensive project through the Federal Capital Development Authority (FCDA) of which the proposal was approved after the necessary conditions have been met. Few days after the allocation, a restriction letter was issued by the FCT Minister through the executive secretary of FCDA, Engr. Adamu Ismaila, reverting the company’s rights to use the already allocated site for their project. Disappointed with the development, the company wrote to the authority requesting for another portion of land and after series of back and front round table talks with the authorities, the ghost Minster (as he is fondly called) reluctantly offered them a new piece of land but this time along Airport Road Abuja. With the company eager to ensure their target for the project execution is met irrespective of the unfavorable conditions and irregularities they had faced, the sum of £50k (Fifty thousand pounds) was paid upfront by the agency to a British firm for the world-record endorsements in addition to N800m already washed down the drain during the construction process of the billboard. However, seeing the company’s relentless spirit, a stop work order was issued again by FCDA to Lona Media Limited when the project was almost at its completion stage, this time not on issues of Land trespassing, violation of way or other easements known to law but allegedly because of a letter they received from the centenary city authorities stating that the billboard will block the view of the estate from the expressway if erected. The Centenary City is on top of rock along the airport road and won’t truly be blocked by any structure, observed our reporter. The actions of the Minister was criticized by Nigerians with the opinion that such laudable project has the tendency of providing the enabling environment for small and medium business owners to thrive with the capacity of attracting investors around the globe.